Organisers gave a clear answer: even if at the last minute, they’re ready. Despite protests and overly-repressive reaction of security forces the evening will most likely be remembered for the 3:1 victory by most Brazilians. Though preparations were still ongoing yesterday, Arena de Sao Paulo met all expectations, both by FIFA and spectators. Most ticket-holders will most likely only remember the final score, which is partly the outcome of very decent organization of the event. According to our information, crowd circulation around the stadium was very good despite fears over first crowd of such magnitude. 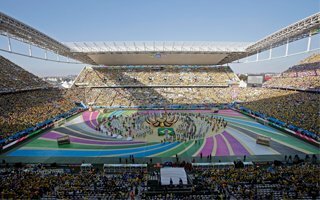 Interestingly, FIFA’s own data suggest the number of spectators for Brazil-Croatia exceeds capacity – 62,103 people for 61,606 seats. If there were any incidents, they were minor. Some flags were banned from the lower tier, most notably those of Corinthians’ supporters. But fans had no trouble with hanging them in the upper part of the stadium. The fan fest public viewing area also saw no significant disturbances. However, in several parts of Sao Paulo demonstrations were formed to protest the World Cup. Some images went viral, like one showing a man being pepper-sprayed in the eyes from just inches away while being restrained by several officers. While credibility of several images may be low, most press agencies present in the city confirm the protests were met with very aggressive response of authorities, not to allow the demonstrators closer to event sites.